1st Lieutenant Mark J. Toschik was born in Phoenix, Arizona on 22 March 1950, the second of four children, to Larry and Ceil Toschik. Mark was introduced to hunting at the age of seven years and immediately showed natural skills in rifle target shooting. In High School Mark excelled in his shooting skills and won both scholastic and civic awards. Mark was a doer and engaged in outdoor adventures which included river rafting and archery. At the age of 15 years he was helping to pioneer sport parachuting in Arizona. A natural leader, he rose swiftly in rank in his R.O.T.C. program and upon graduation he enlisted in the Infantry. On completion of basic and advanced individual training, Mark attended and successfully completed the Airborne Course, Officer Candidate School and the Special Forces Qualification Course. As a newly commissioned 2nd Lieutenant Mark completed further training to prepare him for deployment to the Republic of South Vietnam in 1969. On his arrival in Vietnam on 2 January 1970 Mark volunteered and was selected for duty as a Platoon Leader, 1st Platoon, Company E (Ranger) 75th Infantry ( Airborne), 3rd Brigade, 9th Infantry Division, Tan An, Long An Province, Republic of South Vietnam. 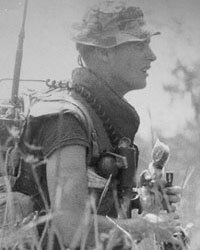 Between 2 January 1970 and 11 August 1970 Mark engaged in combat operations against hostile forces in the Mekong Delta, RVN and in Cambodia. Mark lead his fellow Rangers by example, with professionalism and zeal, earning him the respect and admiration of his fellow Airborne Rangers. While encouraging his fellow Rangers to give 100% and then some, his dedication to his comrades, duty, and mission directly contributed to the high rate of efficiency and success of the Ranger Operations conducted against the enemy forces by Echo Rangers. On 11 August 1970 1st Lieutenant Mark Toschik was killed in action in Dinh Tuong Province in the Republic of South Vietnam and was posthumously awarded the Silver Star Medal for gallantry in action as well as the National Order of Vietnam, Fifth Class. The circumstances of the action leading to these awards are as follows: Lt. Toschik had made an aerial reconnaissance by helicopter early in the day to determine night ambush positions. He was inserting one of his teams just before dark and was flying in the insertion helicopter, while his platoon sergeant flew in another cover helicopter. Lt. Toschik had inserted his team which had moved out quickly to avoid detection. As the helicopter lifted off, it came under point blank fire from the rear. The action was quick and fierce. Lt. Toschik was the only one on the ground or in either helicopter who saw the enemy. He must have seen the muzzle flashes and immediately returned fire. No one knows when he was hit, but because the contact was brief and the rescue swift, he must have been hit with the initial burst. Lt. Toschik fought back savagely with all his resources. He expended his 30 round magazine and 20 round magazines of two additional M-16 rifles in the helicopter. He fired all the rounds of his 9mm pistol and to attest to the relative closeness of the encounter, he threw the empty pistol at them. He then ripped the .38 caliber pistol from the copilots shoulder holster and emptied it before the helicopter hit the around. It is difficult to imaqine how quickly this all took place. Lt. Toschik's helicopter had hardly touched down and lifted off when it was brought down, having traveled less than the length of a football field, in a crescent arc. The support helicopter flying in the same arc pattern landed swiftly alongside the downed craft. Upon impact, Lt. Toschik, who was not wearing a seatbelt, dismounted and unstrapped the two wounded pilots and pulled them to safety. He then moved around the far side of the downed helicopter searching for other crew members. He could go no farther and collapsed on the spot where his platoon sergeant found his body. The posthumously awarded medals presented to Mr. Larry and Mrs. Ceil Toschik on behalf of their son lst Lieutenant Mark Joseph Toschik are as follows: the Silver Star Medal for Gallantry in Action, Bronze Star Medal (First Oak Leaf Cluster), Air Medal ( Second and Third Award), the Purple Heart and the National Order Of Vietnam, Fifth Class. Prior to death, lst Lieutenant Mark J. Toschik had been awarded the following: the Bronze Star Medal, Air Medal, National Defense Service Medal, Vietnam Service Medal, Vietnam Campaign Medal, Combat Infantryman Badge, Parachutist Badge and the Expert Badge with automatic rifle bar. In keeping with Mark's devotion to hunting, the famous Ducks Unlimited Conservation Organization developed a Canadian marsh area as a memorial to him in Northern Saskatchewan, Canada. The Memorial Plaque reads as follows: LT. MARK J. TOSCHIK MEMORIAL PROJECT, BUILT BY DUCKS UNLIMITED (CANADA) WITH THE CO-OPERATION OF THE GOVERNMENT OF SASKATCHEWAN AND LOCAL LANDOWNERS, AN ARIZONA COMMITTEE OF DUCKS UNLIMITED PROJECT, DEDICATED TO MARK TOSCHIK, ARIZONA DUCK HUNTER, WHO AT 20 GAVE HIS LIFE IN QUEST OF MEN'S FREEDOM IN VIETNAM, AUGUST 11, 1970.
lst Lieutenant Mark Joseph Toschik brought honor and prestige to his country, the United States Army, his Ranger Unit, the Special Operations and Ranger Communities by his valorous deeds and unwavering dedication, to duty and his comrades, for whom, he willingly and without reservation, made the ultimate sacrifice.